Home Tags Posts tagged with "us and israel"
President Donald Trump is continuing his first foreign trip with Israel after visiting Saudi Arabia. The president flew in from Saudi Arabia, a key US ally, where he gave a speech to Arab and Muslim leaders at a summit. In Israel, Donald Trump will hold talks with both Israeli and Palestinian leaders during the course of his two-day stop. He has called an Israeli-Palestinian peace agreement “the ultimate deal”, but has been vague about what form it should take. Donald Trump has said he prefers to leave it to both sides to decide between them in direct talks. 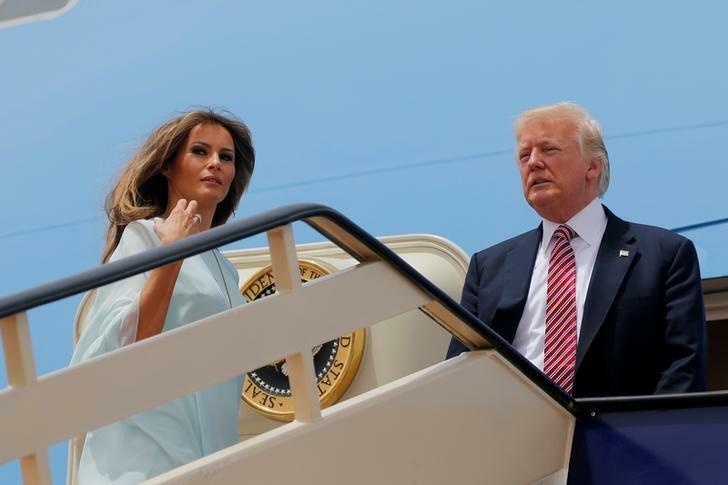 According to the Associated Press and Israel’s Haaretz, President Trump’s flight between Saudi Arabia and Israel was likely to be the first between the two countries, that have no diplomatic relations. The president has been widely seen as considerably more supportive of Israel than his predecessor, Barack Obama. Donald Trump has taken a softer position on the contentious issue of Israeli settlements, suggesting that their expansion rather than their presence might hamper the search for peace. More than 600,000 Jews live in about 140 settlements built since Israel’s 1967 occupation of the West Bank and East Jerusalem, land Palestinians claim for a future state. The Israeli settlements are considered illegal under international law, though Israel disputes this. President Trump has also sent mixed signals on the issue of Jerusalem, pledging to move the US embassy there from Tel Aviv, angering Palestinians and delighting Israelis. However, he has since stalled, with Secretary of State Rex Tillerson recently telling NBC News that President Trump was weighing it up. Israel regards the whole of Jerusalem as its capital, while the Palestinians claim the east as their capital. The international community does not recognize Israeli sovereignty over Jerusalem and countries maintain their embassies in Tel Aviv. There has been some consternation in Israel in the run-up to President Trump’s trip over remarks made by administration officials. Israel’s PM Benjamin Netanyahu rejected Rex Tillerson’s suggestion that moving the embassy might harm the peace process, while a US Consulate official caused outrage by saying the Western Wall, one of Judaism’s holiest sites, was “not in your [Israel’s] territory but part of the West Bank”. President Trump is expected to visit the Western Wall, located in the Old City of East Jerusalem, in a private capacity on May 22 – the first sitting US president to do so. Donald Trump will also visit the nearby Church of the Holy Sepulcher, where according to Christian tradition Jesus was buried and resurrected. His trip also comes days after it was reported that the president had leaked to Russia’s foreign minister classified intelligence information said to have come from an Israeli source. The incident has raised questions about the confidentiality of secret intelligence passed to the US by its closest Middle Eastern ally. A huge security operation is under way for Donald Trump’s visit, during which he will hold separate meetings with PM Benjamin Netanyahu in Jerusalem on May 22 and Palestinian leader Mahmoud Abbas in Bethlehem the following day. A day before Donald Trump was due to arrive, Israel’s announced economic and development concessions for Palestinians, including easing some restrictions on movement and approving industrial construction projects.